← Do you have leftover candy canes or peppermints from Christmas? Hash Brown Potato Pie – A great Sunday breakfast! Years ago when Southern Living Magazine offered their Southern Living Cooking School my Mom and I made the event an annual treat. It usually happened around Mother’s Day so I would treat Mom to a day of cooking instruction and lunch. Each year goody bags were given to all attendees with promotion items such as a wooden spoon, coupons and recipe booklets. This hash brown potato pie was featured in an Ore Ida booklet I received. One year we were both lucky enough to win door prizes! Those wonderful cooking shows ended years ago, much to our disappointment. The wonderful dishes demonstrated live on in my kitchen and through books like the one that featured this recipe. It’s easy to make and delicious for a Sunday treat. I often serve it to company. It makes 6 servings but if there are only 4 of us I just cut into quarters. Serve with some bacon, fresh fruit and biscuits if desired. Heat oven to 350 degrees F. Beat together eggs and milk in a medium bowl; stir in potatoes, green onions, and salt. Stir in 1 cup of the cheese and half of the bacon. Pour into a greased 9-inch pie plate. (I use a glass pie plate.) Bake 25 to 30 minutes or until center is set. Sprinkle remaining bacon and 1/2 cup of cheese over top of pie; continue baking 3 to 4 minutes or until cheese is melted. This entry was posted in Breakfast, Company Worthy and tagged Bacon, Breakfast, eggs, hash browns, special breakfast dish. Bookmark the permalink. 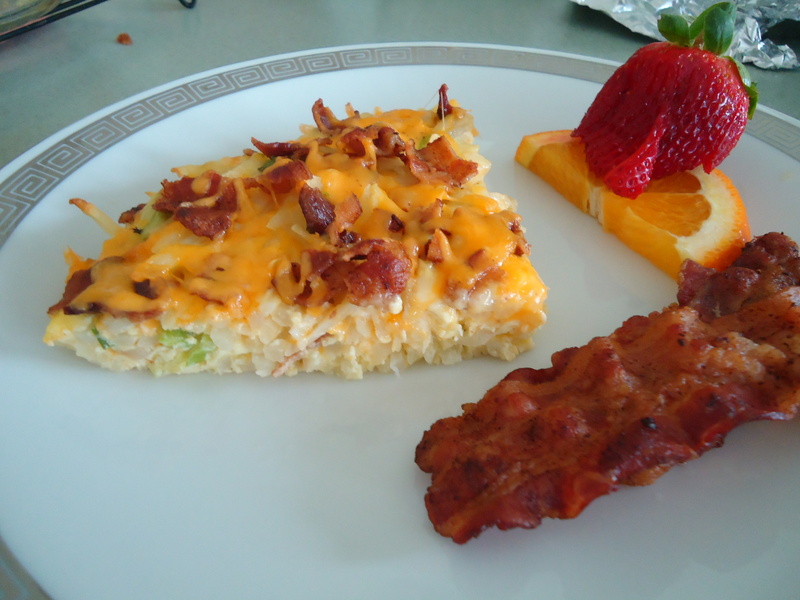 1 Response to Hash Brown Potato Pie – A great Sunday breakfast!